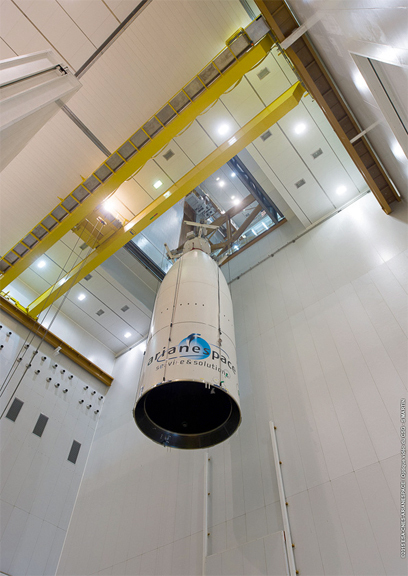 [SatNews] The heavy-lift Ariane 5 for Arianespace’s April 15 mission is now complete following integration of its dual-satellite payload consisting of THOR 7 and Sicral 2 at the Spaceport in French Guiana. Encapsulated in an ogive-shaped protective payload fairing, THOR 7 was lowered into place yesterday over its Sicral 2 co-passenger, which had been installed atop Ariane 5’s core section during preceding activity. This integration milestone, achieved at the Spaceport’s Final Assembly Building for Ariane 5, clears the way for a new phase that includes the launch readiness review on April 13, which is to be followed by Ariane 5’s rollout to the ELA-3 launch zone the next day. Ariane 5’s upper payload section – composed of THOR 7 and its payload fairing – is raised inside the Spaceport’s Final Assembly Building for installation atop the launcher. Designated Flight VA222, liftoff is scheduled during a 1 hour, 54 minute. launch window opening on April 15 at 4:43 p.m. local time in French Guiana, with the two spacecraft to be deployed on a mission lasting approximately 34 minutes. As the upper payload in Ariane 5’s arrangement, THOR 7—which was built by SSL (Space Systems/Loral) for operation by Telenor Satellite Broadcasting—will be released first in the flight sequence. This relay platform is equipped with Telenor’s initial high-performance Ka-band payload, designed to serve the maritime sector—offering cost-effective solutions and high-powered coverage over the North Sea, the Norwegian Sea, the Red Sea, the Baltic Sea and the Mediterranean. THOR 7 also has a Ku-band payload for broadcast and television services in Central and Eastern Europe. Sicral 2—a military telecommunications satellite designed to provide strategic and tactical telecommunications links for French and Italian military forces, as well as reserve capacity for other NATO nations—is to be deployed from the launcher’s lower passenger position, with its separation to follow that of THOR 7. The spacecraft will be lofted in the framework of a turnkey contract that the Italian Defense Ministry and the French DGA armament agency (Direction Générale de l’Armement) have with Thales Alenia Space Italy. Telespazio, among others, is responsible for the launch service.